Across the industry, this latest update has been interpreted as the final nail in the coffin of organic reach. Strategies can no longer rely on short, snackable pieces of content that only seek to momentarily pause people’s attention while they scroll through their feeds. Building your audience wholly (or mostly) through rented social sites isn’t going to produce sustainable results anymore. Marketers have to produce stories that transcend these ephemeral 15-second cotton-candy spots to create loyalty beyond the “like” button. So, let’s talk about producing content that your audience not only wants to consume but will seek, content that’s deeply and personally relatable, content that people interact with and share with their networks. In 2001, apparel brand Vans sponsored the feature-length documentary, Dogtown and Z-Boys, chronicling the early skateboarder culture of Southern California. While Vans funded the project, the filmmakers retained creative license. There are no Vans ads running along the bottom of the screen and no gratuitous shots of major characters wearing Vans outfits head to toe. Of course, some of them did wear Vans shoes. Or hats. Or T-shirts. But as the brand was already making inroads into skateboarding culture, it felt natural to see Vans apparel in the film. Flash forward to this decade and Vans is still producing documentary films to capture the attention of its customers. Living Off the Wall is one of Vans’ documentary video series, a series of short films in which we meet punk rockers, skateboarders, tattoo artists, and other young people who not only exist but thrive outside of the mainstream. Vans created the content to both celebrate its 50-year-old “Off the Wall” slogan and reaffirm the brand’s values: authentic, individual, fearless, youthful. The series has attracted almost 300,000 views, while the Vans YouTube channel has more than 348,000 subscribers. Why is the series effective? Why do people watch it? Everyone wants to belong to a culture or community. People want to see inside the world of like-minded people. Vans customers and non-customers alike watch these shorts to experience subcultures and characters they either identify with or are fascinated by. Though Vans’ first film project was released in 2001, the brand is still creatively knocking it out of the park in 2018. At the heart of documentary filmmaking is the art of telling a good story, and the best have a few ingredients in common. For a documentary film to resonate with an audience, it should feel authentic. A brand-made documentary must be honest and true to the brand’s values and culture. Just as importantly, it also has to appeal to the target audience’s interests. Think of a Venn diagram in which one circle is your company’s core values and the other is your audience’s passions and desires. The story landscape lies at the intersection: a setting your audience can’t help but be curious about or drawn to, and where your company can embody its human side. A great example of an artfully crafted story landscape is from outdoor-clothing brand Patagonia. 180 Degrees South is a 2014 feature-length documentary that follows a small group of young men on a journey to the farthest reaches of Patagonia (the place, not the brand) in South America. The film firmly resides within that intersection between the brand’s core values – high-quality clothing made responsibly and a commitment to conservation – and its customers’ aspirations – experiences and appreciation of the outdoors and adventure travel. This film does not show Patagonia products (though it does include conversations with Patagonia founder Yvon Chouinard). Instead, the film explores the complexities of environmental conservation in countries where the need for economic development threatens some of the most wild and stunning scenery in the world. The documentary – and the brand behind it – was covered widely in the media, including major global publications like The Wall Street Journal. The strongest stories in any format feature a hero facing some type of conflict. Frodo taking the ring to Mordor. Rocky fighting for the championship belt. Every doctor on every TV show who persevered to save a patient’s life. Documentaries are no different. Before you begin crafting a story, you must identify a hero and his or her conflict. The hero’s journey is a classic story archetype in which the hero has a clear goal underlined by an emotional import with obstacles to overcome along the way. Consider how Intel’s documentary, Look Inside: Jack Andraka (produced by Venables Bell & Partners), follows the classic hero’s journey. INTEL – “LOOK INSIDE- JACK ANDRAKA” from Dana Shaw on Vimeo. Sixteen-year-old Jack won the grand prize at the 2012 Intel International Science and Engineering Fair for his part in developing a new method to detect pancreatic and other cancers. The film is only two minutes, but it’s a strong example of the hero’s journey: An underdog high school student with a goal of fighting cancer overcomes multiple obstacles to successfully develop a new diagnostic technique and win a prestigious award. Intel and Venables Bell did a fantastic job finding and telling that story. While every story should have a hero, I’m not necessarily talking about the good Jedi taking on the evil empire. Anyone can be a hero if framed correctly, particularly if the person is a compelling character. Is the person entertaining, like the vibrant characters in Dogtown? Is the person quirky or fascinating to watch? Does he or she have a passion for something that the audience can feel burning through the screen like Intel’s Jack Andraka did? Above all, is the hero relatable to the audience? Will the hero create a connection? Will people care about what happens to him or her? The central character shouldn’t be a scripted corporate mouthpiece because that won’t feel authentic to the audience. A corporate insider usually sits outside that story landscape sweet spot. Avoid this mistake and push for compelling over bland. Church’s Chicken found a number of compelling characters for its documentary series Fast Company. Each episode follows a group of people competing for the title of world’s fastest drummer in a speed-drumming competition. If you’re looking for characters best described as “a little bit quirky,” the world of competitive drumming has them to spare – and that’s why this series works so well. Fast Company, Episode 1 – Presented by Church’s Chicken from Church’s Chicken on Vimeo. Church’s Chicken wanted to increase brand awareness and traffic. Fast Company not only achieved those goals but delivered a significant uptick in sales at Church’s restaurants. I’ve touched on a few different aspects of brainstorming documentary stories. 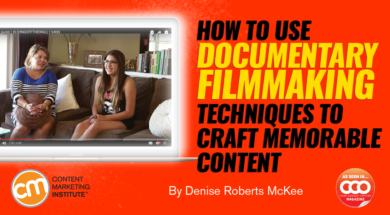 Now let’s talk about how you and your company can best use the documentary format. Always be looking. Create a story database and capture interesting ideas when they surface even if their use or relevance isn’t immediately apparent. Don’t take your own stories for granted. What might be routine to you could be fascinating to your audience. Be creative. Don’t let your objectives rule your concept development. Ideate the stories, then map them to your objectives to see what aligns. Think about the voice. Who’s the best fit to share the story you’re telling? It doesn’t need to be epic. Often, the smaller, more intimate or personal stories can be the most powerful. You wouldn’t have your company’s payroll accountant do your root canal, would you? Work with professionals who know how to create and produce documentaries with a proven track record (and a proven show reel). If you have professional filmmakers and storytellers in-house, great. If you don’t, find them elsewhere. Bring in people from the entertainment industry. After all, that’s where the best practitioners are working. And, believe it or not, many do make themselves available to work on projects for brands. While hiring an industry pro may be more expensive than buying a camera for the marketing team, the right person adds massive value to your project through experience, business savvy, distribution expertise, and metrics know-how. Any discussion with internal stakeholders about producing a video too often results in the question, “Will it go viral?” Strike that phrase from all conversations. Most people can’t define what it means to “go viral” anyway, never mind connect it to concrete business goals. Instead, get specific. Identify your objectives. Who do you want to interact with your documentary? How? How many video plays do you expect? How many new subscribers would be considered a good result? Define success so you have a goal to aim for. Also, keep your fears in check. You may worry that outsourcing to an external team risks diluting your story’s power or making it more generic – after all, they don’t live and breathe your brand every day. However, the opposite result is more likely as filmmakers know how to weave your company’s values into a story without being heavy handed. You are armed with the basics of a successful brand documentary approach. Now get out there and bring your clients’ stories to life. A version of this article originally appeared in the May issue of Chief Content Officer. Sign up today to receive your free CCO subscription. Experience the stories of Content Marketing World Sept. 4-7 in Cleveland, Ohio. Register today and use code BLOG100 to save $100. Denise Roberts McKee is the chief story strategist at Electric Campfire StorySessions. She specializes in helping organizations find their unique and iconic stories, and then craft those stories into compelling, engaging content. She is a founding member of September Club, a documentary creative shop whose projects include JIM & ANDY (VICE/Netflix) and ZEDD: TRUE COLORS (Geffen/Innerscope) and oversees operations for its sister company About Face Media. The Online Marketing Institute named Denise as one of their Top 40 Digital Strategists in Marketing. Her recent book “The Electric Campfire: A Marketer’s Guide to Documentary Storytelling” provides an in-depth look at documentary storytelling strategies for content development and marketing. Follow her on Twitter @drmckee.